But I understood Merc and Ferrari were quite interested in 18" rims ? @MrTuK: That was a joke. Seriously, it's still on the table but is very unlikely to happen next year. 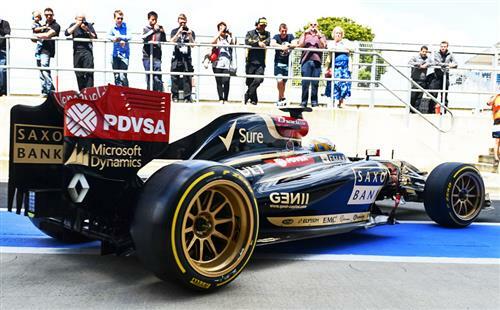 This is what an F1 car looks like on 18" wheels. @Uzayr: No, Force India will debut its new car tomorrow. The last couple of minutes of today's test. Ericsson is on mediums, Kvyat on mediums, Grosjean on softs, Kimi on hards and Sainz on mediums at the moment. @ankur: It was just to get an idea of what they would look like, not a true test. Lotus was happy to give up a day of testing for the promotional advantages. Lol, I did'nt even know if Halfords sold 18" rims like they use on DTM etc ! But seriously all they would need is extra 1" of suspension travel ? @MrTuK: They would need a lot more than that. Airflow, tyre flex, weight distribution are all impacted with knock-on impacts to boot. Chequered flag. Massa finishes the day on top. Updated times and a full report to come.